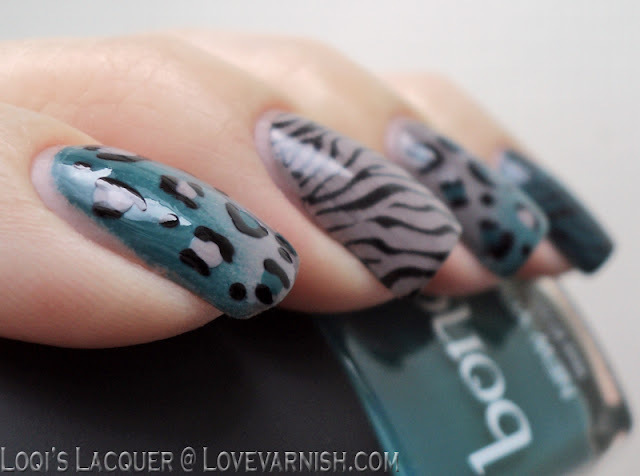 Love Varnish: 31 Day Nail Art Challenge - Animal Print Nails! Hi loves! Yay, animal print is up this week, and I've prepared something fun for you! At first I wanted to do leopard but that isn't really the challenge anymore... stamping snakeskin isn't either and zebra isn't my personal favorite. 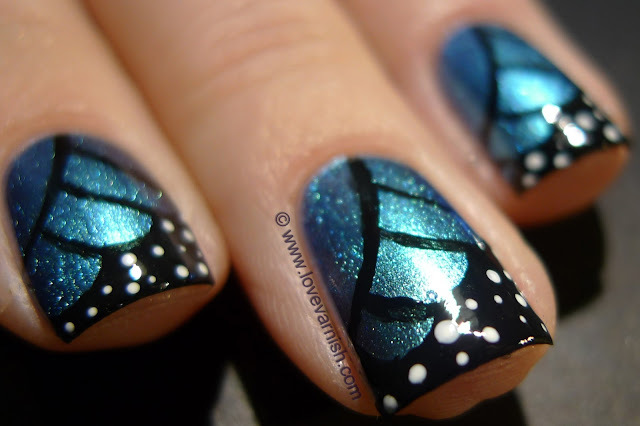 But, butterfly nails... oh, they look so pretty and delicate and fun! So I tried them. Freehand! I started with a base of Chane Azuré (2 coats) and let it dry. Then I grabbed a small brush and acrylic paint and went to work! I did every line free hand and used images on Pinterest as a reference. After the black dried I bit I used a very small dotting tool and white acrylic paint for the little dots. They came out quite well! I hope you like them too. 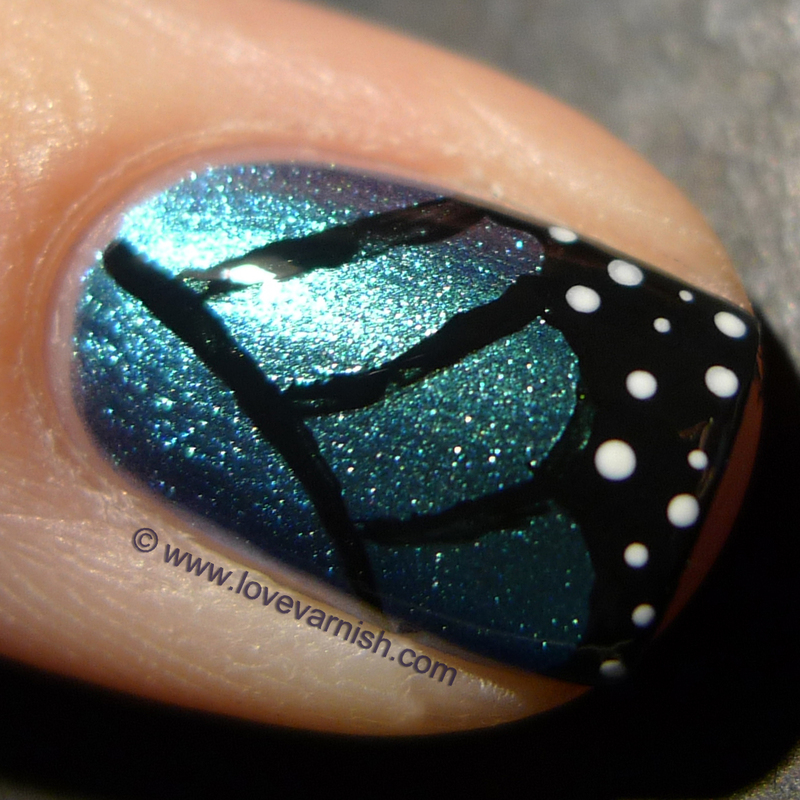 Have you ever tried your hand at freehand butterfly nails? Hi everyone! I absolutely adore animal print nails, I think they are tacky in a good way and I really don't do them often enough! For this challenge manicure I didn't want to stick with just one animal print, so I decided to go mixed medium with stamped zebra stripes and freehand leopard spots. And while I was combining stuff I thought I might as well use two colours instead of one. For my middle finger and pinky (and thumb) I went for solid colour nails with Bondy - Tavern on the, and Essie - Chinchilly, with the zebra pattern from bundle monster 223. And for my index and ring fingers I went for an angled gradient with alternating spot colours. RAWRRR! Hope you guys like it and see you soon! Stay tuned for challenge day 14: Flower Nails! Aaaah babe I love your nails so much this week! Great combo ♥. Oh Deborah, your freehand butterfly wings are perfect. And what a perfect base color! Perfect! 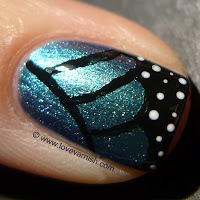 And Loqi, I LOVE the gradient beneath the leopard print! Looks great! Thanks honey! I love yours too! It never even crossed my mind to do butterfly wings. Azure is really perfect for it! Thanks! Let ut know how it turned out! Yeah it was a last minute heat of the moment decision haha, but I am glad I did :). Thanks my dear Angie ♥. I want the stamping plate now haha - the lines are so much prettier! I love your butterfly nails! Azure is the perfect color for it. Thank you Lorraine, I'm proud of how they turned out!